Not terribly long ago, it was not the resorts that were the destination, rather it was the Caribbean itself. Cerulean, crystal clear water, sandy beaches, balmy breezes rustling through palm trees, and warm, sunny weather year round were the lure. A room at a resort was viewed merely as a place for luggage storage and sleeping. Cap Juluca’s original owners saw things differently, and their view changed how visitors experience the Caribbean. In 1988, Cap Juluca opened with a restaurant and the first three villas, which were far different than any others in Anguilla or much of the Caribbean for that matter. The Anguillan resort had the idyllic beachfront location with native landscaping on Maundays Bay, but also it had an unconventional focus – its guest rooms and bathrooms. 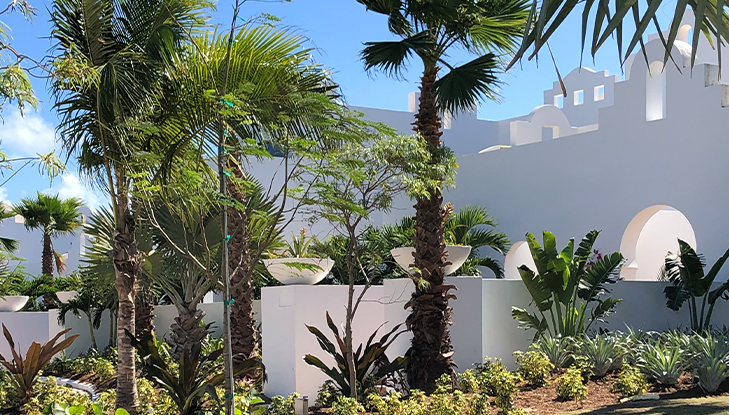 Instead of replicating the traditional Caribbean theme, Cap Juluca looked more like Morocco with its white buildings, domed roofs, arches, and columns. In 2017, Cap Juluca’s owners sold their intimate, luxury resort to London-based luxury hotel and leisure company, Belmond. Belmond operated the resort under Belmond Cap Juluca for a few months before closing the resort’s doors on August 27, 2017 to undergo a massive, top-to-bottom renovation, including 25 new beachfront units to increase inventory from 96 to 121 rooms. 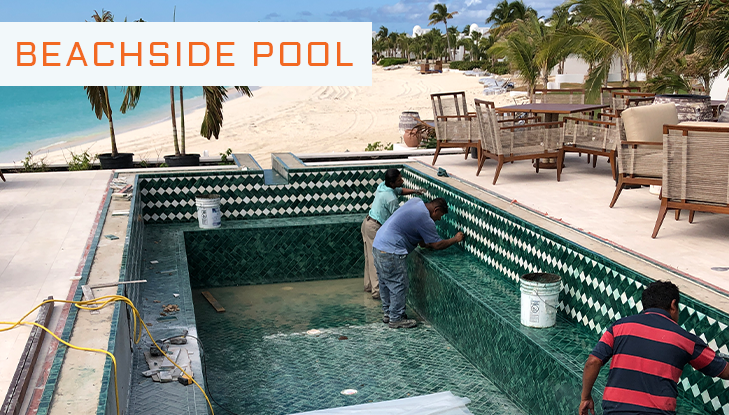 The renovation also involves new interior furnishings for all suites and villas, new culinary concepts, spa enhancements, and new and refurbished public areas and landscape architecture. The company’s vision is to once again let Belmond Cap Juluca take the lead in a new era of Caribbean beach-chic glamour, especially on Anguilla. SKS Studio was well into refreshing existing landscape design elements to update the resort to Belmond’s standards when Hurricane Irma devastated the region, including the Cap Juluca. The category 5 hurricane ravaged the existing landscape, which was established and mature. “Once we were able to resume our work, the project became a post-hurricane landscape assessment. Based on the damage, we were no longer refreshing the resort’s landscaping. Belmond is relying on our landscaping restoration expertise to restore the landscape that can be saved and replace the trees and plants that could not, much like we did at One&Only Palmilla after Hurricane Odile in 2014. Hurricane Irma doubled our work to be done at Cap Juluca, yet the opening date remained on schedule for November 2018,” explains Sean Simms, SKS Studio president. In addition to designing landscaping that connects guests with the resort’s remarkable nature, SKS Studio blended the infinity pool and accommodations into the landscape. The grounds are filled with vibrant botanicals and indigenous foliage. While new landscaping was required to replace what Irma destroyed, careful assessment in identifying the plants and trees that can, with specialized care, make a full recovery is the financially and environmentally right approach.